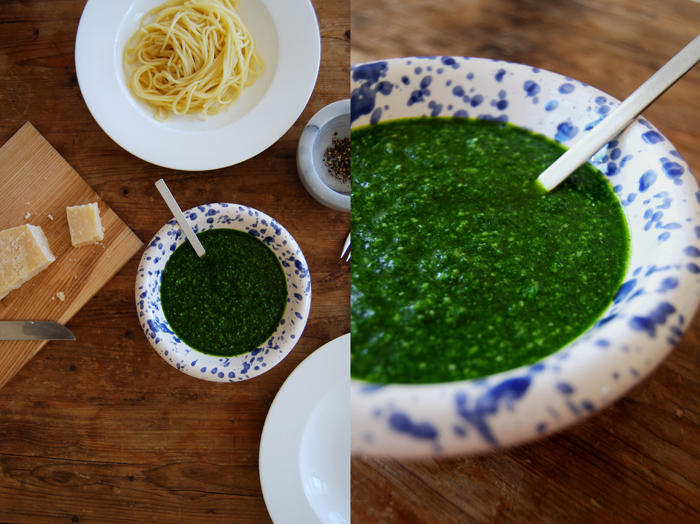 When I wrote about my wild garlic soup two weeks ago, a couple of the more attentive followers of eat in my kitchen told me that “ramp” is the more common name for my beloved “wild garlic”. I’m happy they let me know and to avoid confusion I will change its name in my recipes to “ramp”. “Wild garlic” has a bit of an adventurous touch, I like that, it fits to its distinct taste but if only a few know it as such then I have to compromise. At the moment, this plant is at its seasonal peak. The long leaves cover the moist ground in the forests, filling the air with their beautiful smell of fresh green onions. When I go to the market, I buy ramp in bulk as I’m a bit obsessed with it. I even start my shopping earlier in the morning just to make sure that I get enough of the little bunches for all the recipes I have in mind. 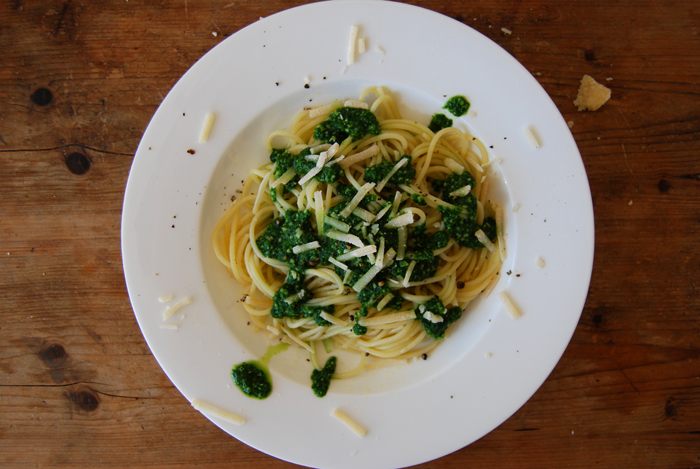 The recipe I make the most (at least once a week) is a pesto, spicy and very strong in taste, great with pasta or spread on toasted dark bread which is an absolutely delicious snack! In the fridge, it stays fresh for a few days so I always prepare a big bowl. 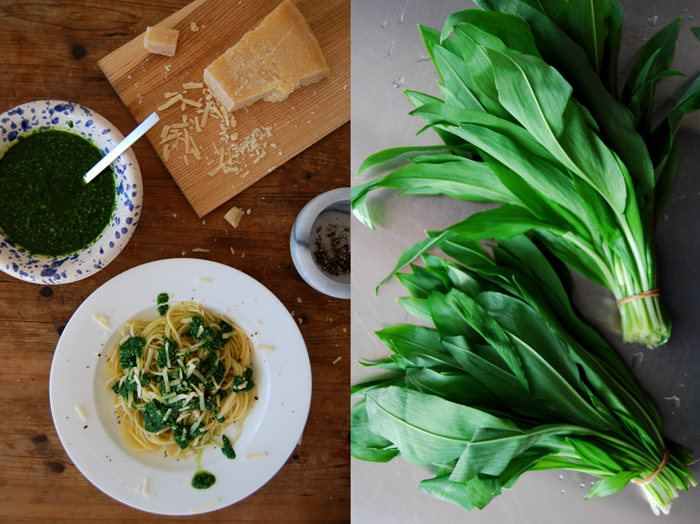 For my pesto, I use the leaves of 2 bunches of ramp (around 90g / 3 ounces), rinsed and dried well, and mix them in a blender with 110ml of olive oil, 50g / 2 ounces of parmesan and 1/2 teaspoon of salt. You could add some pine nuts but I find them too weak to come through, I prefer to concentrate on the ramp and the cheese. 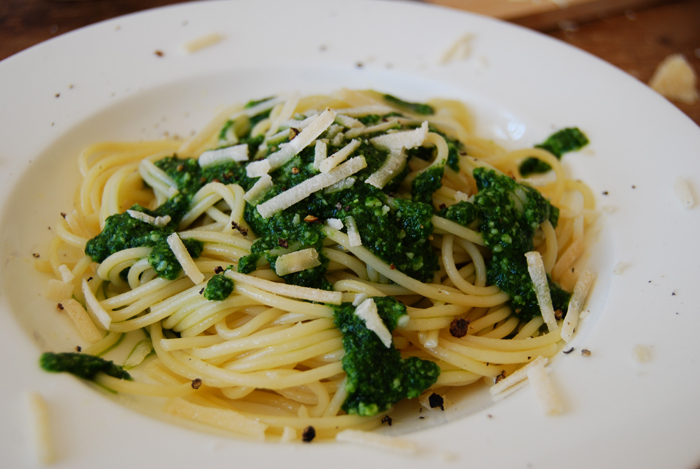 When we eat the pesto with spaghetti or linguine I add some crushed pepper and more grated parmesan on the warm pasta. Tomorrow I will write about a burger which didn’t manage to escape my ramp obsession! Meike, growing up, ramp was a must in early spring. I loved it so much just plain with some salt. I have never seen it here in Texas, unfortunately. I can only imagine how great it is in peso with spaghetti! I can almost smell that wonderful aroma of hot spaghetti and ramp pesto. Yummy! Every year when I buy my first bunch of ramp, I’m always impressed how strong it smells and how intense its taste is, I love it! I appreciate it even more as its season is so short.